A player can own more than one of the specified teamType, therefore joining by ownerId and teamType is not sufficient to uniquely identify the team to join. Specify the team by teamId instead. How are you creating your teams? and what are the settings for the team type? I have been facing a similar issue. In which, I created the team as mentioned in the tutorial page (link). with Max Membership per user is 0 & Max Ownership per user is Unbounded. I can able to create a team from one user and when I tried to join the team which I created from the previous user gives me the same error. 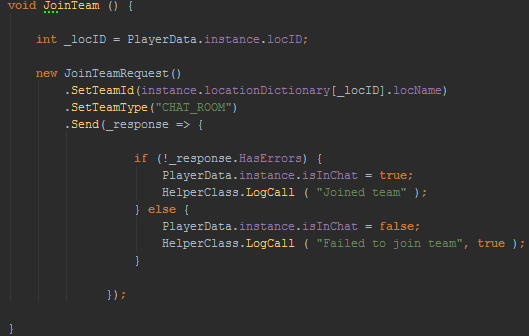 FYI: I don't understand the (Max Membership per user & Max Ownership per user) I'm getting this error ("teamType":"NOT_SINGULAR_USE_TEAMID") is mainly because of those parts. If so, please give me how to proceed with that, what values to give for that.